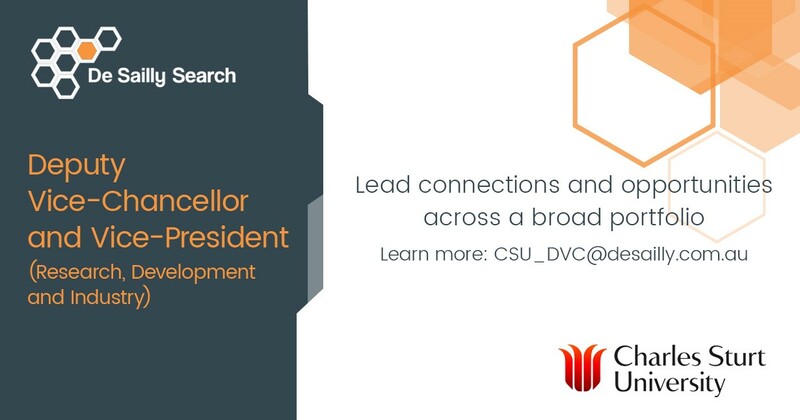 Charles Sturt University is seeking a leader who can steward the development of collaborative connections between CSU and industry, end-users and stakeholders to strengthen and expand the research agenda. They will seek closer strategic partnerships based on the internationally competitive nature and relevance of CSU research and the opportunity to provide Higher Degree by Research students with a more comprehensive training. Research at Charles Sturt University is underpinned by the CSU Research Narrative (revised in 2017) which encapsulates three interdisciplinary research spheres: Resilient People, Flourishing Communities and Sustainable Environments. The DVC RDI will also lead the development of the AgriSciences Research and Business Park (the AgriPark) at the Wagga Wagga campus that extends beyond the CSU research agenda and will bring research, innovation, education and employment opportunities to the region. As a member of the Vice-Chancellor’s Leadership Team of the University, the Deputy Vice-Chancellor (Research, Development and Industry) will provide strategic advice to the Vice- Chancellor on a range of issues, with a specific emphasis on the Research, Development and Industry portfolio and the ‘Our Communities’ Strategy. This position will work closely with the Vice-Chancellor, the Deputy Vice-Chancellor (Academic) and the Deputy Vice-Chancellor (Students) to ensure an integrated approach to planning, especially infrastructure and the strengthening of the teaching – research nexus. This position presides over, or is a member of, key governance committees within the University relevant to the portfolio and represents the Vice-Chancellor on selected external Boards and Committees including the Upstairs Regional Incubator Board and the Discovery Translation Fund Evaluation Committee. This position will be based on the Wagga Wagga campus or potentially the Bathurst campus. This phrase from the Wiradjuri, the traditional custodians of the land of the original CSU campuses, describes the university’s ethos. CSU is ‘a university of the land and people of its regions’. Around half of CSU students are from rural and regional locations. Australia’s largest regional university, CSU is also the country’s leading provider of distance education. An executive search is being undertaken by De Sailly Search on behalf of the University. De Sailly Search will support the Selection Panel in identifying the widest possible field of qualified candidates and assisting in the presentation and assessment of candidates against role requirements. Prospective candidates are encouraged to have a confidential discussion early in the process. – Names and contact details of three to five potential referees (these referees will not be contacted without the prior consent of the candidate).